Music reviews online. Nothing more. Nothing less. Stephen Mallinder (Cabaret Voltaire), Phil Winter (Tunng) and Benge (John Foxx & The Maths), return with their second studio album after the impressive ‘LA Spark’; one of those hidden gems that blew me away, the day it arrived through the door to review. As with their debut, this latest offering is a hotbed of analogue synths and peculiar vocalisations that teeter on the edge of darkness. This time however, the trio have concentrated on the more quirky elements that they only just touched on with previous output; and the end result draws more on funk and is ever so more playful for it. ‘White Glue’ is even more minimal than its predecessor and that is somewhat surprising, considering just how sparse an affair that opus was. This time out though, the clear space feels somewhat warmer than before, with ‘Stop’, ‘Dirty’ and ‘Stupid’ presenting an element of a band having a lot of fun. Luckily, things do get darker on tracks such as ‘Days’; and this is a welcome change back to form within an album that appears just a little too happy for its own good. Once again, Mallinder, Winter and Benge have produced a quality LP of worth. But for me, I like my music that touch darker; and thankfully the latter half feeds my personal preferences. With time I am sure ‘White Glue’ will get its claws under my skin; but for now it is just a quality release that doesn’t quite hit the highs of its older sibling. Much is to be expected from London based Wrangler, upon noting their ranks contain ex-Cabaret Voltaire man Stephen Mallinder, Phil Winter of Tunng and Benge of John Foxx fame; as expectations are immediately set to a high level of anticipation. ‘Theme From Wrangler’ doesn’t disappoint as an opening gambit, with whispering visceral vocals, cutting through an electronic obscure, analogue glide; floating across a sea of drum machines and rich bass attack. In contrast, ‘Lava Land’ owes more to the earlier works of John Foxx, delving into more marketable territory as 80’s danceable synth is spliced apart with more Voltaire-isms than you can shake a stick at; and is as infectious as it is disconcerting. ‘Music IIC’ plays on Kraftwerk sensibilities, whilst ‘Space Ace’ thuds along in repetitive percussive and pulsating fashion; only to be bettered with the paranoid and psychotic ‘Harder’ that weaves, bobs and turns and pulls on all their influences overall, as one long unsettling journey. Channelling Dark Ambient territory, the eighth and closing track to this album ‘Peace and Love’ is anything but, in a musical sense. Maybe this is all the love (and indeed the peace) that these stalwarts can offer us, as the grinding electronics come to a staggering halt. One thing is for certain; and that is, I do have a lot of love for the majority of this release. British music has always revelled in its pioneer status and Wrangler hark bark to era where artists from these shores flew that flag with a vengeance. 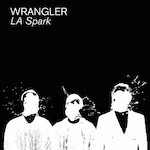 There is something wonderfully comforting about ‘LA Spark’ for an older listener such as myself, as the cycle of sound spins full circle; and back to an age, where there was an integrity to creating music as an art form that should be revered.